Popped in for a quick pint before a meeting on a Monday lunchtime. It was surprisingly quiet, but it did enable me to bag a seat and a fast pint. 6 ales on the hand pumps with most offerings from the Greene King stable. My pint of Hardy and Hanson's Rocking Rudolph @ 4.2% was pleasant enough & did the job. I like this pub, the ales are normally good and there's never any bother here. Nice part of town as well so a traditional pub is a perfect fit. This couldn't be more different to the Fox in Coulsdon that I just popped a post on. I used to work near here and first used it 35 years or so ago. I come back quite regularly. In many ways, it hasn't changed a bit - and is all the finer for it in my view. For sure, it gets packed in the evenings and if you stand near one of the doors then expect to be jostled. A throwback and not everyone's cup of tea but good fun. The last pub of my 2 quick "ticks" in Shepherd's Market last Thursday night. Very busy and traditional pub that was heaving at the seams both inside and out, service was extremely quick even though the European barmaid had to ask me twice what beer I wanted, maybe she just didn't hear me first time. 6 beers on hand pump I opted for a pint of Ellgood's CXXX which was excellent. While I was there one of the beers was changed for a fresh barrel, I didn't catch what they put on. Decent pub and one of the better one's in the very busy and excellent Shepherd's Market area. Worth a visit but prepared that after work on a week day it will probably be rammed. 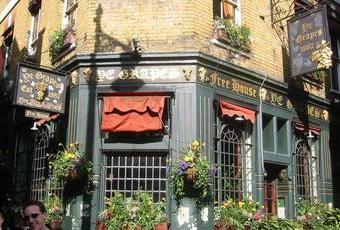 Nice, unpretentious small pub with a decent range of ales and efficient service. Certainly one of the better pubs in the area.